On Saturday morning I sewed this overstuffed burlap garden pillow. I had made the yo-yos and English Paper Pieced hexagon flowers ahead of time. These were my first time sewing EPP hexagons. I've been trying a lot of new things lately as you will see further down. This is also my entry in Quilt Sandwich Fabrics' "Briar Rose Challenge." Overstuffed burlap garden pillow designed and sewn by Anita LaHay. I used burlap for the pillow and jute ribbon. I am giving this to my Mom for her patio garden and those are common materials used in gardening but I have used them in a different way. This is a softer burlap which I bought in a decor shop. A close-up of some of the yo-yo flowers. I used the Clover yo-yo maker (in different sizes) to make the yo-yos. Super quick and easy! An English paper pieced hexagon flower with a bee in the centre. My narrower ric-rac was white so I used a pigment ink stamp pad to colour it green. The wider ric-rac is the colour it came from the store. Jute ribbon for a border above the frog fabric. Quilt Sandwich Fabrics sent me the frog fabric and the orangey coloured strawberry fabric to use in the challenge. My first ever Swoon Block. The start of another Quilt of Valour. 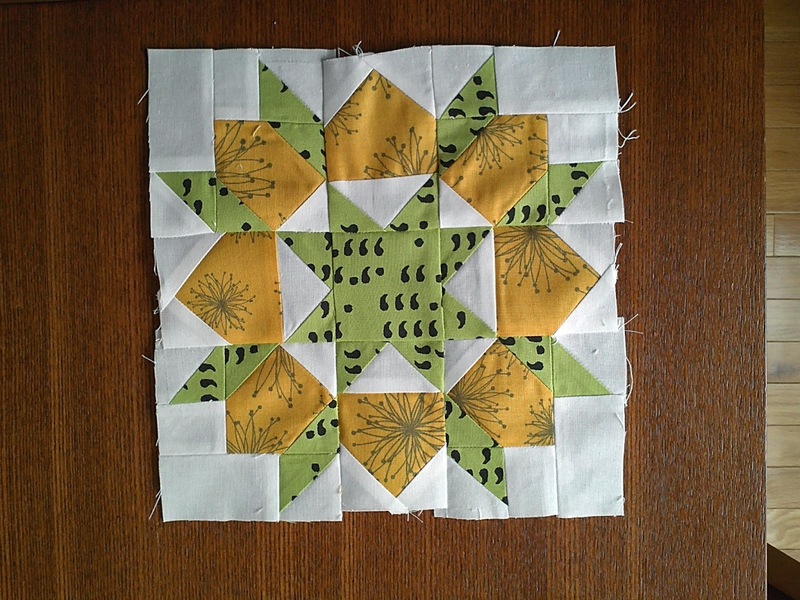 On Sunday I cut the pieces for this Swoon block and this morning I sewed it. It took over three hours all together to make but I am very happy with how it turned out. 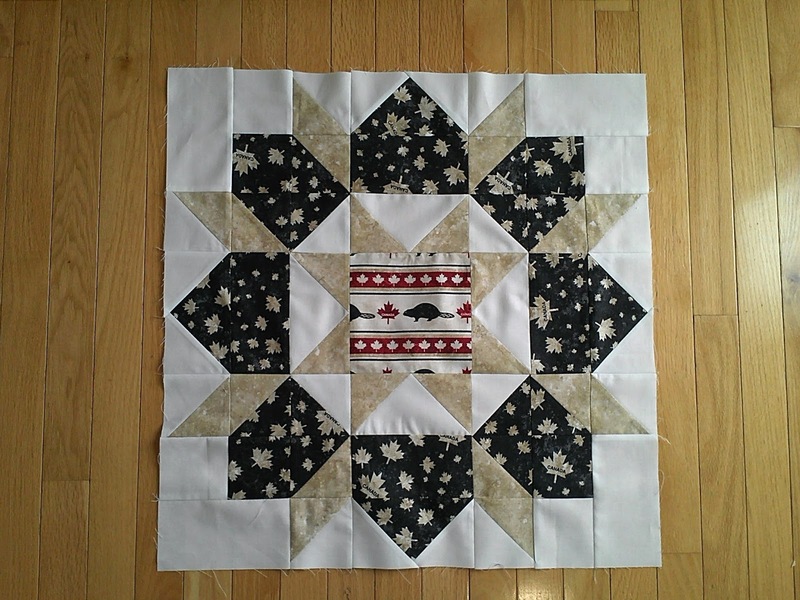 This is the start of my next Quilt of Valour. My first ever mini Swoon block. Made friends with Mr. Seam Ripper. This afternoon I tried sewing a Mini Swoon block and although it went faster I had trouble. I sewed several pieces wrong and had to take out the seams with Mr. Seam Ripper. I was not a happy camper and it's quite raggy around the edges. I hope I can make it work in my "Design Your Own Sampler" quilt. Other than that, we seeded a very large vegetable garden plot at our community garden and got finished before a good soaking rain came. I also seeded and planted bulbs for the flower gardens around the house. I have put all the seed packs into a notebook and plan to keep notes on how things are growing and producing so I have a reference for next year. Happy Victoria Day! Thanks for stopping by my blog!